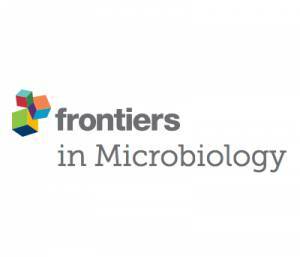 Our YPD medium and SC-Ura medium have been mentioned in the following article: Alternative Glycerol Balance Strategies among Saccharomyces Species in Response to Winemaking Stress. Roberto Perez-Torrado, Bruno M.Oliveira, Jana Zemancikora, Hana Sychrova, Amparo Querol. Yeast strains origin, availability are described in Table 1. Two different strains of each species were studied. For S. cerevisiae, T73 model wine strain (Querol et al., 1994; Lopes et al., 2010) and the commercial wine strain Fermol Cryophile FCry (AEB Group); selected as adapted to low temperature (Gamero et al., 2013) were chosen. The 108 and Chr 16.2 strains isolated from natural environment were used as representatives of S. paradoxus. 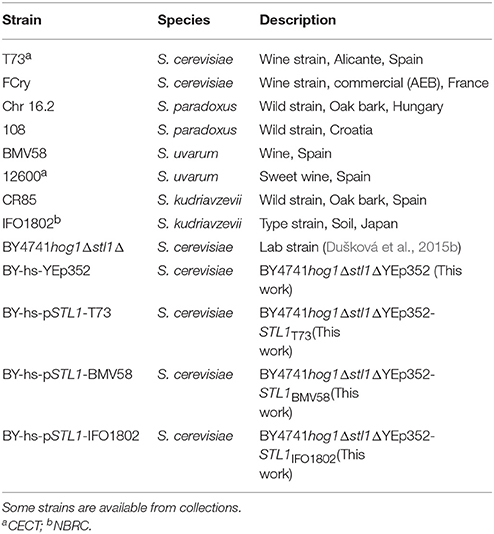 For S. uvarum, the 12600 and BMV58 strains isolated from wine in Spain were studied. BMV58 was commercialized (Lallemand Inc) because of its high glycerol production and good fermentative properties (patent ES2330709 B1). For S. kudriavzevii species, IFO1802 (type strain), and the CR85 wild strain isolated in Spain (Dušková et al., 2015b) were used. The S. cerevisiae BY4741Δhog1Δstl1 (Pérez-Torrado et al., 2009) was used as a laboratory strain for the expression of STL1 genes and comparison of the function of their products under hyperosmotic-stress conditions. Yeast cells were maintained and grown in YPD medium (2% glucose, 2% Bacto peptone, and 1% Yeast extract) or SC-Ura medium (YNB 0.67%, glucose 2%, Drop-out –Ura 1.92 g/l (Formedium)) at 28°C for the S. cerevisiae and S. paradoxus species and 25°C for S. kudriavzevii and S. uvarum species. The wine fermentations were performed in 250 ml bottles filled with 200 ml of MS300 synthetic must (100 g/L glucose, 100 g/L fructose, 6 g/L citric acid, 6 g/L malic acid, mineral salts, vitamins, anaerobic growth factors, 300 mg/L assimilable nitrogen) simulating standard grape juice (Bely et al., 2003) at 12°C with agitation (150 rpm) in triplicate. Overnight precultures were inoculated at 5.0 × 106 cells/ml density determined by measuring OD600. To study the expression of genes related to glycerol balance under hyperosmotic stress, the cells from exponentially growing precultures were washed with water and transferred to YP (2% Bacto peptone and 1% yeast extract) with 2% glucose or 2% mannitol as a source of carbon, to the same medium supplemented with 1 M sorbitol (hyperosmotic stress), which is not assimilable for any of the species studied, or to H2O (hypoosmotic stress). This experiment was performed in 2 l flasks filled with 400 ml of media in triplicate at 25°C and 150 rpm. The tolerance to hyperosmotic stress was evaluated by drop tests. Yeasts were grown overnight in YPD or SC-ura medium, then cultures were diluted to OD600 = 0.2 and cells were allowed to grow in the same media until OD600 = 1. Then, serial dilutions of cells were transferred to plates with YPD; YPD + 0.8 M NaCl; YPD + 1.25 M KCl, incubated at 12 and 25°C and evaluated each day. The growth of Saccharomyces species was also compared in plates with SC containing 2 M sorbitol or 2 M KCl and supplemented or not with 1 mM glycerol. To investigate the functional differences of Stl1, the growth of BY4741Δhog1Δstl1 cells transformed with appropriate plasmids was monitored on plates with SC-ura containing 0.7 M sorbitol, which or 0.3 M KCl and with or without 10 mM glycerol. Experiments were performed in triplicate, representative results are shown. For the intracellular glycerol measurements, cells were grown in 250 ml flasks with SC-ura with 10% of glucose at 28°C with agitation (150 rpm) in triplicate until the glucose concentration achieved < 2g/l.